You Support Comics Grinder, Right? 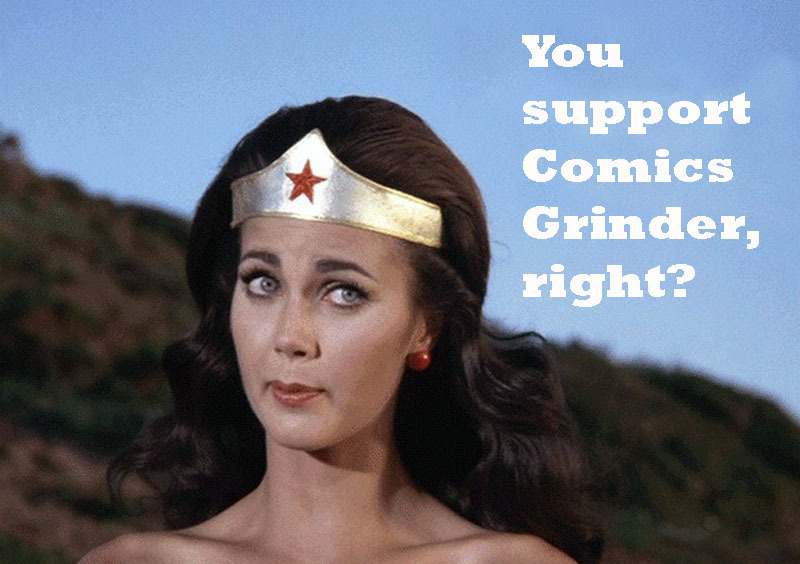 Wonder Woman Supports Comics Grinder. How About You? Do you support all the wonderful features here at Comics Grinder? I’m sure you do in your own way. You’re reading this now, so that’s something! If you’ve been considering doing a little more, then this could be the right time for it. Here’s a handy checklist. 1. LIKE us on Facebook right here. That’s always a fun and satisfying thing to do. Just go right here. 2. SUPPORT the Comics Grinder GoFundMe campaign right here. It’s a great way to pitch in and keep stoking the fires of the Comics Grinder engine. Let your friends know about it too. On Facebook and Twitter, share a link to the campaign right here. 3. COMMENT and comment often. Your comments are valuable and further grow a sense of community around here. I always appreciate new friends and feedback! And, of course, your likes are always welcome and greatly appreciated. 4. CONTRIBUTE your own writing on comics and pop culture. For the most daring of you out there, feel free to submit something and add to all the fun. 5. DONATE is an anytime thing, whenever you feel like it. You can also buy things here, like a commissioned drawing. Find the donate button right here. 6. BUY is more to the point. Why not buy my new book right here. “A Night at the Sorrento and Other Stories” is for you if you love fantasy, horror, humor, and alternative comics. 7. LUCK plays a role in life more than we know. Just rounded this off to a Lucky Seven. Spread the word about Comics Grinder. You’ll be glad you did.